The iPhone sure has changed over the years. The iPhone packed a lot into its first astonishing decade. Not only has the device itself evolved significantly since its promising-but-by-no-means-perfect beginnings, but it’s transformed Apple’s business — and many of our very lives — in the process. All this week, Cult of Mac’s “iPhone Turns 10” series will look at the innovative device’s massive impact on worldwide culture. The iPhone, which launched on June 29, 2007, truly changed the world. What iPhone milestones have passed since Steve Jobs introduced this stunning hybrid device, which combined a widescreen iPod with touch controls, a revolutionary mobile phone, and a breakthrough internet communications device? 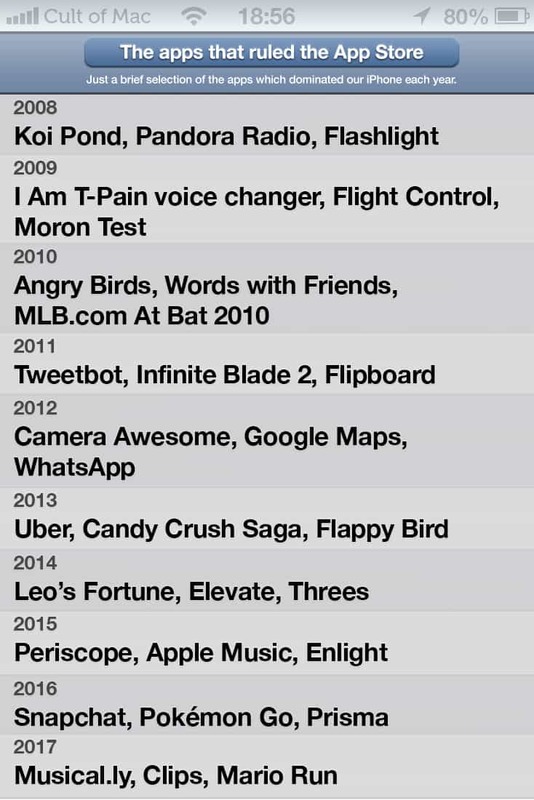 Check out our handy guide to 10 years of iPhone history. Late 2003: The iPhone story begins more than a decade ago, when Apple industrial designer Duncan Kerr gives Jony Ive and the rest of the Apple Industrial Design Group a demo of multi-touch technology. Kerr had been working on this with Apple’s input engineering group, and it’s a real UI breakthrough: Unlike the crude touch surfaces of the time, which could register only single presses, multi-touch opens up possibilities like swiping, pinching and zooming. Although some consideration is given to the idea that this could work as a mouse replacement for a future touchscreen Mac, it doesn’t take long for people to realize it’s a perfect interface for a mobile device. Late 2004: Concerned that cellphones might soon cannibalize the iPod’s market share by adding music player capabilities, Jobs — in a rare and un-Jobsian move — teams up with another company to bring an Apple-sanctioned, iTunes-friendly phone to market. Jobs picks Motorola, proposing that the companies produce a successor to the popular RAZR handset that would include a built-in iPod. Meanwhile, inside Apple, two separate iPhone projects get underway: the so-called P1 and P2 projects. 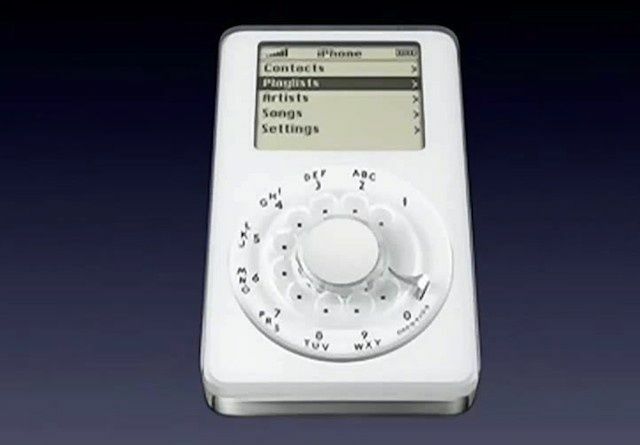 P1, managed by Tony Fadell, basically grafts the functionality of a phone onto the click wheel of the iPod. A mockup of the design is later shown off by Jobs as an illustration of how not to do things. Unlike the eventual iPhone, this concept can’t run apps or surf the internet, and entering numbers is slow. Yep, this is how the iPhone could have looked if project P1 had taken off. The P2 project, built around Apple’s multi-touch tech, proves a lot more promising. Jony Ive and his team hammer out the hardware design, which Ive is fond of saying should look like an “infinity pool.” Meanwhile, a team led by Scott Forstall works on the software. Hardly anyone gets to see both hardware and software; the project is one of Apple’s most closely guarded secrets. 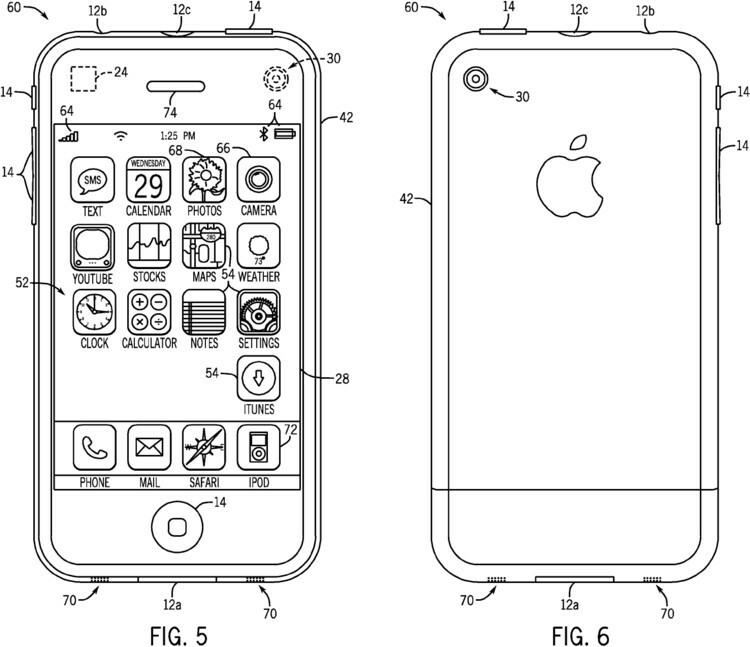 The iPhone as it appeared in early Apple patents. September 2005: The ROKR E1 phone, the result of Apple’s collaboration with Motorola, is released. Although some buyers seem happy with a phone that doubles as an iPod, Jobs hates it. The ROKR is badly designed, fiddly to use, and inexplicably suffers from a 100-song limit, despite having the capacity to store more tracks. January 9, 2007: Jobs unveils the real iPhone in all its glory. He also says Apple is dropping the word “Computer” from its company name. The tech world goes all kinds of nuts for the iPhone. Despite the furor, sales at the historic launch were considerably smaller than during today’s iPhone rollouts. In 2007, it took the iPhone 70 days to hit a million units sold. The iPhone beats other contenders from the 2007-era gadget pack, including the Nikon Coolpix S51c digital camera, the Netgear SPH200W Wi-Fi Phone and the Samsung P2 music player. The iPhone immediately gets recognized as a breakthrough device. June 2008: A year after introducing the original iPhone, Jobs unveils its successor, the iPhone 3G, at Apple’s Worldwide Developers Conference. The device adds GPS, 3G data, tri-band UMTS/HSDPA, and a new plastic polycarbonate housing. Complaints about battery life follow. 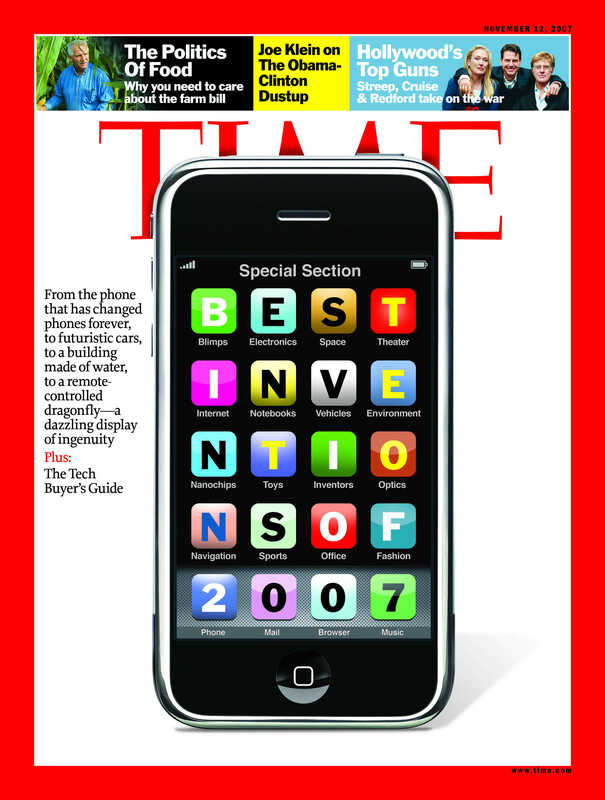 July 2008: The second most significant day in iPhone history, after the original unveiling, is July 8, 2008, when the App Store opens for business. Jobs originally fought against allowing developers to create their own apps for the iPhone. Eventually he relented, and Apple built an iTunes-style online store where customers could download software programs. At the App Store’s launch, 500 native apps became available to download. How many of these apps do you remember downloading? Do you remember the iPhone 3GS? June 2009: Jobs shows off the iPhone 3GS at WWDC 2009. Chief upgrades include better performance and a 3-megapixel camera with higher resolution and video. A white variant makes this the first iPhone to ship in different color options. Some reviewers question whether Apple improved the phone enough to warrant the upgrade. Alongside the iPhone 3GS, Apple introduces iPhone 0S 3.0. An update to the iPhone operating system brings more than 100 new features, including cut-and-paste functionality, parental controls, multimedia messages and stereo Bluetooth. The last version of iPhone OS to run on the original 2007 iPhone is iPhone OS 3.1.3. 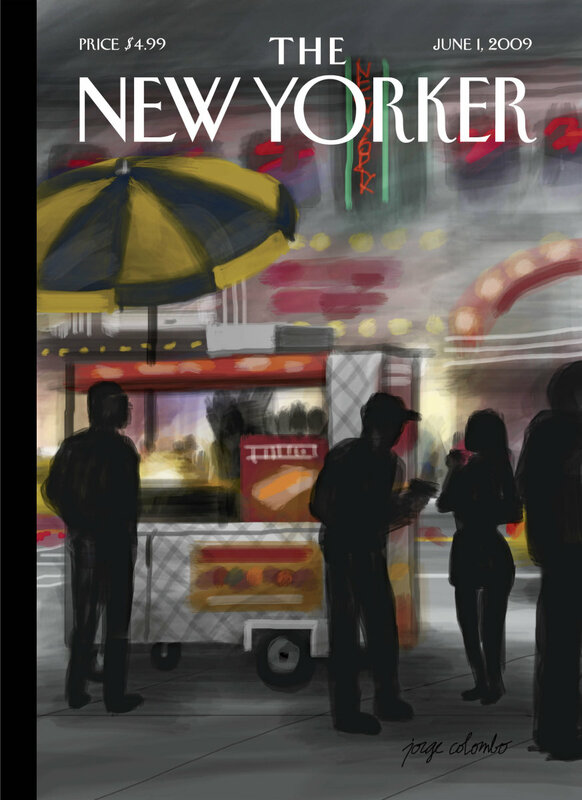 Also that month: Artist Jorge Colombo draws the cover of The New Yorker using his iPhone and iOS app Brushes while standing outside Madame Tussaud’s Wax Museum in Times Square. “I got a phone in the beginning of February, and I immediately got the program so I could entertain myself,” says the artist. This cover was created using an iPhone. January 2010: Google and HTC release the Nexus One smartphone, which boasts a touchscreen keyboard and multi-touch gestures. Apple quickly sues HTC and Steve Jobs starts his “thermonuclear” war on Android. June 2010: Jobs unveils the iPhone 4 at Apple’s Worldwide Developers Conference. The handset’s main selling points include the introduction of FaceTime communications software, an upgraded 5-megapixel camera with LED flash, a VGA-quality front-facing camera, superior Retina display with four times the number of pixels as its predecessor, and flatter, Braun-esque design. 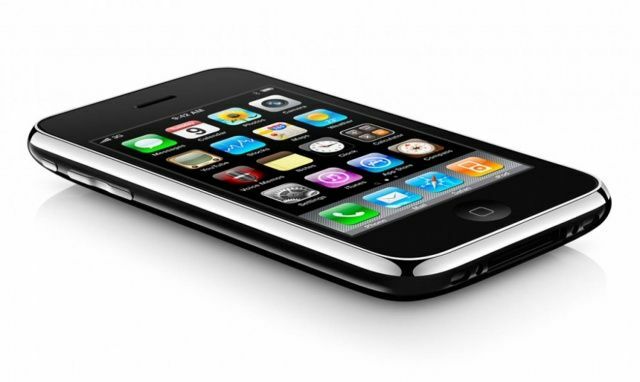 The iPhone 4 measures 24 percent thinner than the iPhone 3GS. July 2010: “Antennagate” hits Apple. Some users complain of dropped calls when using their new iPhones. YouTube musician and Apple fan Jonathan Mann writes a song about the controversy, which Jobs plays at a press event to discuss the news. April 2011: Apple sues Samsung for infringing on iPhone patents with its Nexus One handset. Samsung countersues, claiming that Apple infringed on its mobile-communications patents. July 2011: Not content to dominate on Earth, the iPhone rockets into space. NASA sends two iPhones aboard the STS-135 space shuttle. Houston-based tech and research firm Odyssey Space Research develops an app called Spacelab for the mission, letting astronauts estimate altitude, attempt to read QR codes in zero gravity, calculate their position in space, and measure radiation. October 2011: The iPhone 4s gets shown off at a media event just a day before Steve Jobs dies at age 56. The first iPhone released while Tim Cook is CEO, the 4s’ biggest selling point is the arrival of Siri, which kickstarts an interest in AI assistants across Silicon Valley. November 2011: Celebrated photographer Annie Liebovitz calls the iPhone the “snapshot camera of today,” passing some kind of cultural baton to the device that is increasingly becoming people’s go-to camera. “It is so accessible and easy,” she says. July 2012: The Apple-Samsung patent trial begins. The following month, a jury awards Apple $1.05 billion and Samsung nothing. As decisive a victory as this seems, however, it is step one of a long, convoluted lawsuit that still rages today. September 2012: Apple introduces the iPhone 5, boasting a design that’s thinner and lighter than previous models. It sports a taller display in close to 9:16 aspect ratio. Among other hardware upgrades, Apple makes the controversial decision to include a new Lightning connector, which replaces the 30-pin connector used on previous iPhones. September 2013: Apple breaks with tradition by offering two distinctly different new iPhone models: the flagship iPhone 5s with Touch ID, and a colorful, lower-spec version called the iPhone 5c. Apple will continue to release multiple new iPhones each year (although the “c” variant doesn’t get a follow-up due to disappointing sales). December 2013: Apple finally makes a deal to bring the iPhone to China Mobile, the world’s largest telecom company. This means 760 million potential iPhone buyers in China. Tim Cook ramps up his talk about how China will one day be Apple’s biggest market, and claims that Cupertino designs its new products with the Chinese audience in mind. 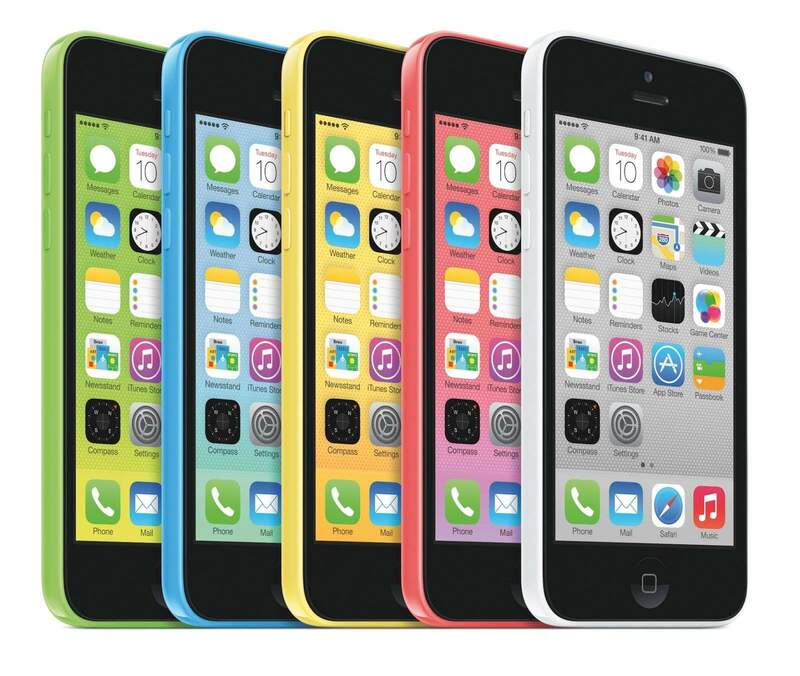 The iPhone 5c was Apple’s most colorful iPhone yet. September 2014: Apple shows off its biggest (no pun intended) refresh of the iPhone in years, with totally redesigned form factors sized at 4.7 inches and 5.5 inches for the iPhone 6 and iPhone 6 Plus. A combined 10 million units sell in the opening weekend. The iPhone 6 Plus shows Apple’s eagerness to jump on the “phablet” bandwagon, although it opens up a whole new controversy in the form of “Bendgate” after word spreads that the ultra-thin design is susceptible to bending if people sit on it. 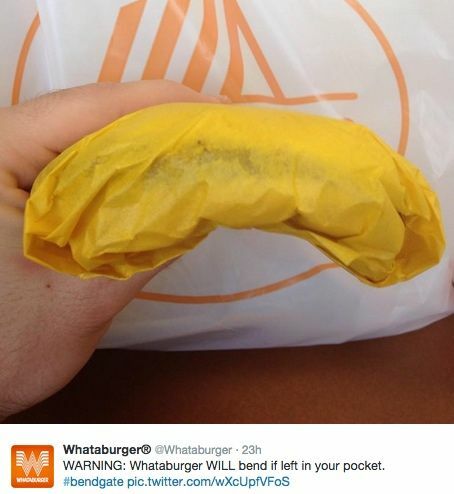 Immediately, the Bendgate controversy gets seized upon by other brands — including Samsung, LG, Nokia and even non-tech brands like Whattaburger — to promote their products. The Bendgate phenomenon was referenced everywhere for a while. January 2015: Acclaimed Sundance Film Festival movie Tangerine makes waves in Hollywood because of its unflinching look at a world filled with transgender prostitutes, meth addicts, pimps and beat cops. It makes waves in the tech community because director Sean Baker shot it on an iPhone 5s. September 2015: The iPhone 6s and 6s Plus go on sale. A record 13 million units sell in the opening weekend; that number includes Chinese sales for the first time. The new models rectify Bendgate with a reinforced chassis, and feature improved hardware and Apple’s pressure-sensitive 3D Touch input. A theme throughout 2016 is that iPhone sales continue to fall each quarter. Having seen almost a decade of sustained growth, the eventual peak and decline is disappointing, but inevitable. With that said, Apple does hit a pretty significant sales target. March 2016: Apple introduces its 4-inch iPhone SE, a successor to the iPhone 5s with an identical design and upgraded internals. July 2016: Apple sells its 1 billionth iPhone. “iPhone has become one of the most important, world-changing and successful products in history,” Tim Cook says. “It’s become more than a constant companion. iPhone is truly an essential part of our daily life and enables much of what we do throughout the day.” It’s hard to disagree! September 2016: Apple shows off the iPhone 7 and iPhone 7 Plus. A lack of major upgrades suggests the company is switching to three-year intervals for total product refreshes, but the handset nonetheless earns good reviews. Plenty of rumors indicate Apple is planning a significant update for iPhone 8 the following year. 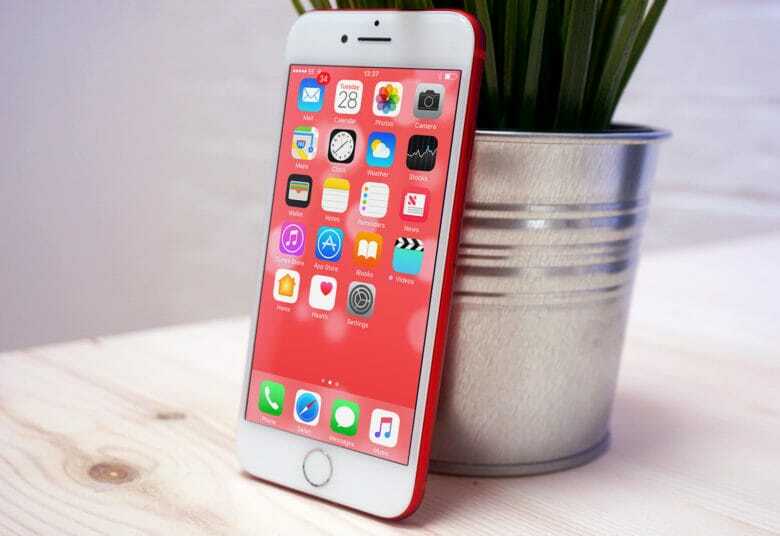 Apple’s gorgeous (PRODUCT)RED iPhone turns heads. March 2017: After years of waiting, Apple finally gives customers a proper red iPhone with the (PRODUCT)RED iPhone 7 and iPhone 7 Plus. Apple has been offering (PRODUCT)RED iPhone cases for years, but this is the first time it has painted the iPhone itself red to support the Global Fund for HIV/AIDS programs. April 2017: Apple starts manufacturing iPhones in India at a Wistron factory in Bangalore. The idea is to sell the phones locally to help bolster the iPhone’s presence in India, where it has struggled due to its high price tag. June 2017: The world grows increasingly excited about the forthcoming iPhone 8, while we all bemoan how quickly time passes and wish we had invested all our money in AAPL stock back in 2007.